Discussions Magazine Music Blog: PAMELA MOORE/Resurrect Me: Available May 14th, 2013! PAMELA MOORE/Resurrect Me: Available May 14th, 2013! 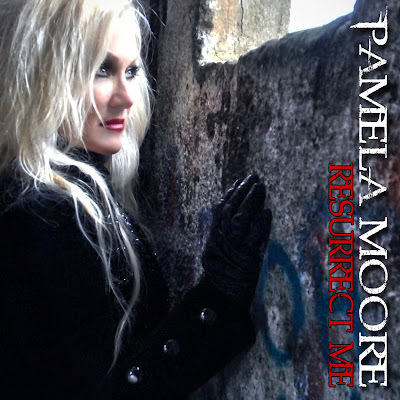 Resurrect Me, the new album from female vocalist Pamela Moore, who is best known for her performance as Sister Mary on QUEENSRŸCHE's 1988 epic release Operation: Mindcrime and 2006's sequel Operation: Mindcrime II, will be released on May 14 via Rat Pak Records. Resurrect Me is described in a press release as an album written in timeless fashion that explores a creative landscape missed by the music industry. [It] is a masterpiece in collaborative effort showcasing powerful, yet intimate vocal imagery, paired with monstrous power metal grooves, and uncompromising musicianship. The album explores the compelling, the infectious and the dramatic. It connects with the listener on a personal level from the first listen." Resurrect Me is collaboration between Moore and Michael Posch, one of Chicago's favorite power metal guitar players who made noise as a founding member of Century Media artists RADAKKA, and was hand-picked by Moore while living in Chicago. While doing shows with the Pamela Moore band, discussions about the direction of Pamela's next work were tossed about. As discussions continued, so many of the traits and concepts were so purely engrained in Posch's own style, it seemed a divine movement was at hand. Early demo work showed a collective vision and energy that was impossible to ignore. Even after deciding to return to Seattle as a permanent base, and what seemed to be the end of a chapter, Moore requested to continue focus work with Posch, in hopes of letting the addictive collection of songs continue to develop. Both were reluctant to close the book on the collective focus that was manifesting. Magic was being made and something pushed the pair onward. The album survived location changes, loss of financial support due to the economic times, personal highs and lows, and sheer distance… to finally overcome... and achieve a polish, and brightness, that goes beyond any hardship endured in the crafting … and the character that was built thru the labor, is deeply present in the recordings. Resurrect Me represents a power metal album that will ring in your head for days after listening. Song after song take you down paths of atmospheric, dark, but passionate and blood pumping metal. It's sure to satisfy Moore's QUEENSRŸCHE contingent of fans, but this moves beyond.. into a level of energy all its own. It even boasts a heavyweight guest list, including a solo from shred royalty Jeff Loomis (ex-NEVERMORE) and a duet with master vocalist Ralf Scheepers (PRIMAL FEAR, GAMMA RAY).